There are a number of things you can do to improve your wedge play. Spend more time practicing your short game. Get a specific or general lesson from a PGA golf professional. See an experienced clubfitter who can recommend wedge changes and or wedge additions and who can also fit wedges properly to you. Watch my 1 hour DVD entitled “Learn All About Wedges”. 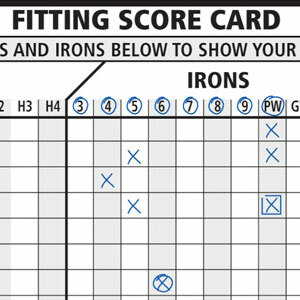 Equipment knowledge can make any golfer more insightful when selecting proper wedges. In evaluate our wedge play we need information. The Wedge Score Card provides this information. 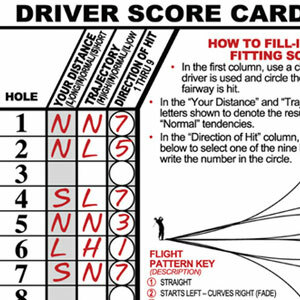 There are many ways to use the Wedge Score Card and here are some suggestions. Your wedge score on the front of this card evaluates your overall wedge play in a general manner. This makes it easy to determine if there is a problem that needs to be addressed. Look carefully at each of the four categories of wedge play, fully shots, pitching, chipping and sand shots. Determine if your problem is specific to one or two categories. You may want to eliminate the category for the full wedge shots and only use the categories of pitching, chipping and sand shots to more specifically evaluate your around-the-green play. Or, simply keep track of all your wedge shots but calculate a separate score for these three categories. 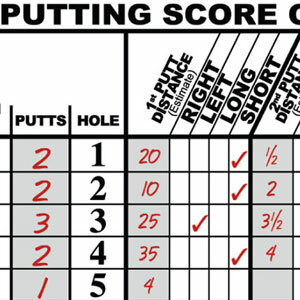 Most golfers keep track of their putts per round. 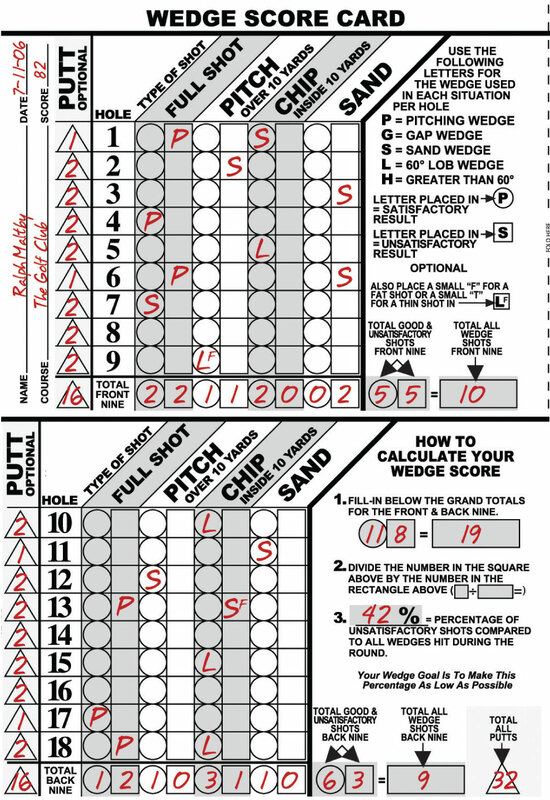 Add your putt total to your wedge total and divide this number by your 18 hole score. I recently shot an 82 with 19 wedge shots and 32 putts. This meant that I had 51 shouts out of 82 or 62% of all my shots were either putts or wedge shots. Do you practice your putts and wedges 62% of the time? 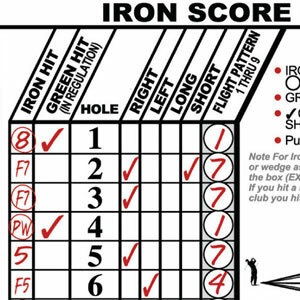 I like to fill out the Wedge Score Card after the round or when I get home. I play each hole over in my head and simply mark it down. This is an actual round of golf I played. My self goal is to always be well below 25% unsatisfactory shots with my total wedge play. Of course I would like it much lower and in single digits but reality forces me to do otherwise. My calculated Wedge Score of 42% is not good for me. I hit 4 poor full pitching wedge shots. This data helped me recount that I hit all of them right or right short of the green. I hit 7 full pitching wedge shots during the round which is 37% of the total wedge shots hit. I hit 2 fat wedges, a lob wedge pitching on #9 and a sand wedge chipping on #13. If I do anything, it will be to hit a wedge fat around the greens. I hit 6 chips out of 19 total wedge shots which is 31% chipping. 5 of my 6 chips were satisfactory or 83%. I think you start to get the idea. You only need to look in the areas where you have or may have problems. It’s much easier to solve problems if you can pinpoint them exactly. The “over 10 yards” for pitching and “under 10 yards” for chipping is measured to the hole and is a suggestion only. You may also use your own definition.